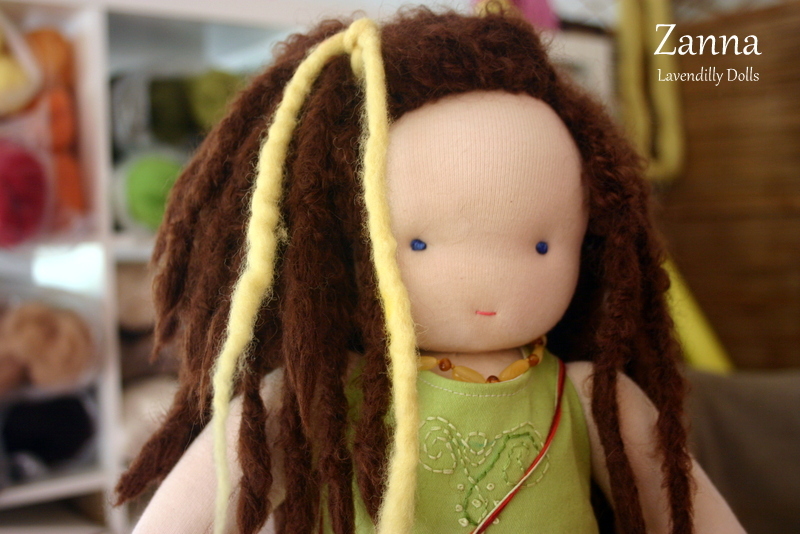 Ask any doll maker and they will tell you that their dolls definitely each form a character and identity of their own. It’s true! 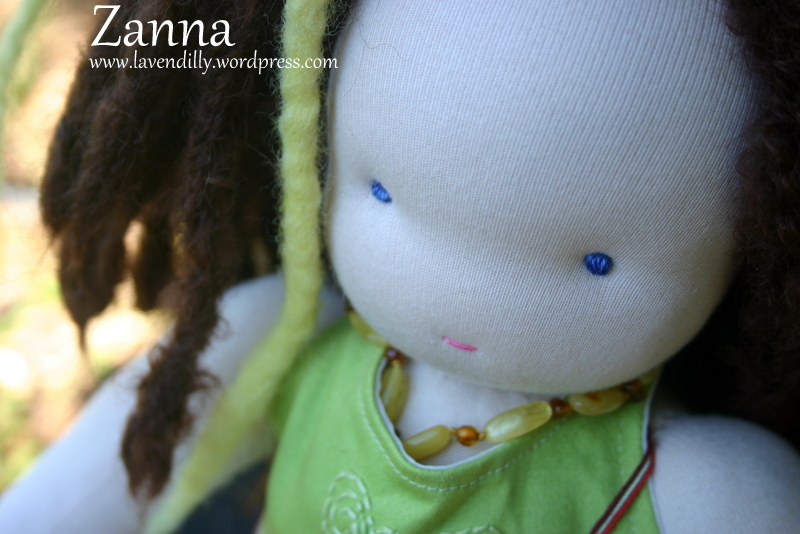 Very often a doll will start ‘speaking’ with me as soon as I begin to sew their pieces together. By the time their body is complete I can barely stop their chatter. You should have seen me with Zanna, choosing fabric for her clothing. She was sitting in a chair nearby, wearing some borrowed dolls clothes and I had fabrics spread all over the floor around me. The choices I was leaning towards (funky patterns, bright colours) were not at all what she ended up with. There she was, leaning back in her chair laughing at the girly fabrics I kept putting out and willing my hand to keep going back to the plain green and the plain purple. This was not a doll for whimsical frills and flounces. Her clothes have purpose and immediately defined her character. This is a doll who needed to be dressed practically for action. She’s fun too – she has a real sense of adventure and is prepared to take a risk. 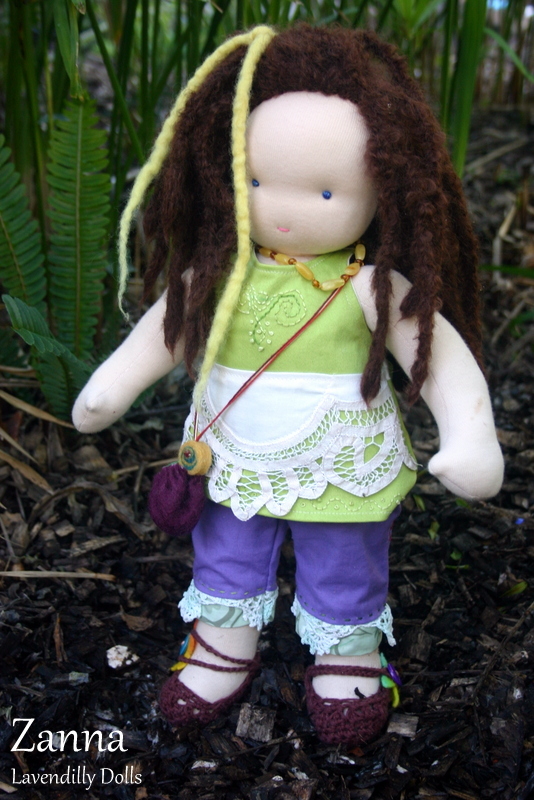 She has lace, yes … but very purposefully made into an apron pocket to keep her magic treasures and herbs in. The crochet hem on her pants is old and handmade by women in my family (yes, I have kept some for myself!). It felt right to share it, and it added to the healing qualities I kept feeling from her. Zanna feels to me like a healing companion. She wanted to be a connection between earth and daily living. When I made her medicine pouch and gave it to her, everything about her changed. She felt happy, like I understood her. Ha! I know what you are thinking. 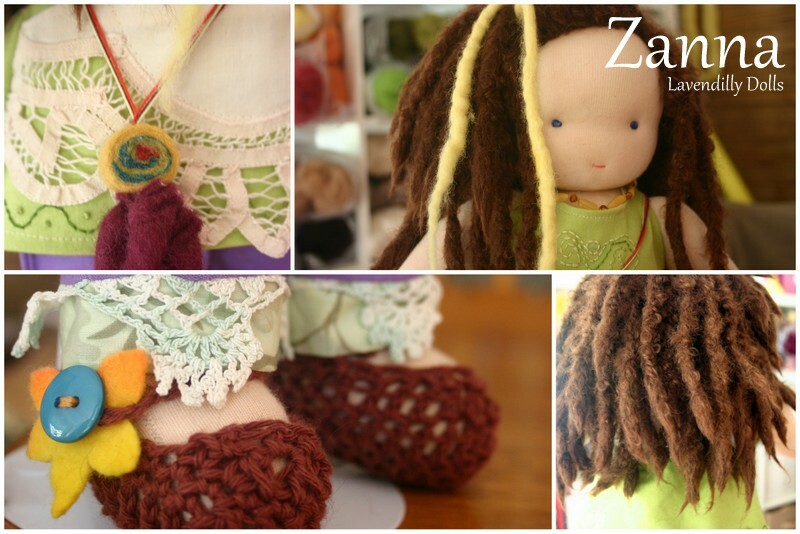 I do connect to every doll I make, but not usually as deeply as I have with Zanna. 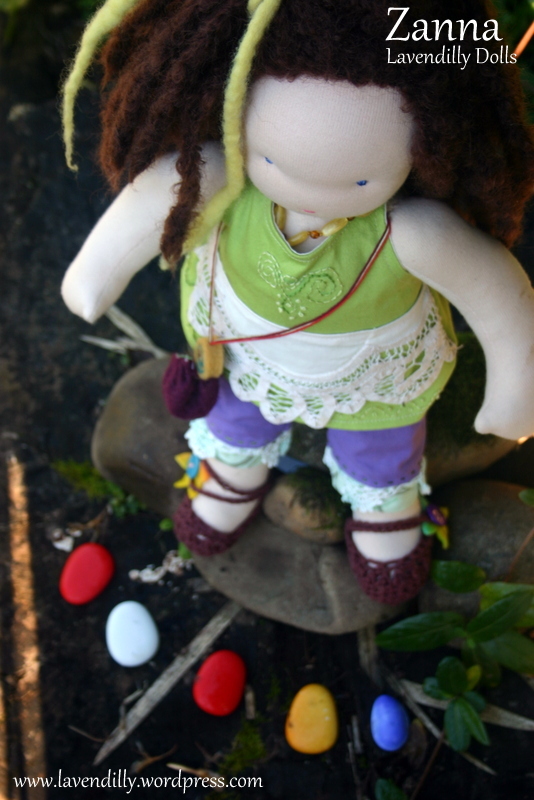 She is going on a long journey to England soon, I feel sure that this connection to earth magik that has been part of her becoming will be helpful to the little girl she is going to journey overseas with. Her embroidered tunic has my blessings stitched over her heart, and her amber necklace is added protection also, and will also be available as a bracelet for when Zanna’s new mother grows older. This is one powerful girl!